After hitting his head on Sunday, I checked on Drew a few times during the night. He came in our bedroom around 8:00, playing his new ukulele and telling me breakfast was ready. Now I knew he was OK. I had a feeling today would be a much better day than Sunday. 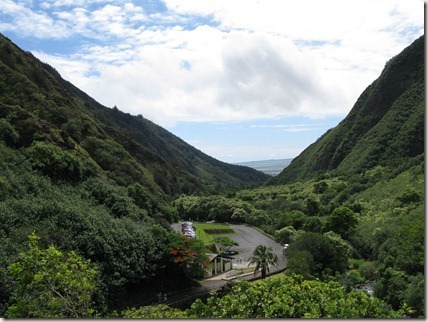 After breakfast, we headed north of Kihei through Wailuku to the Iao Valley. 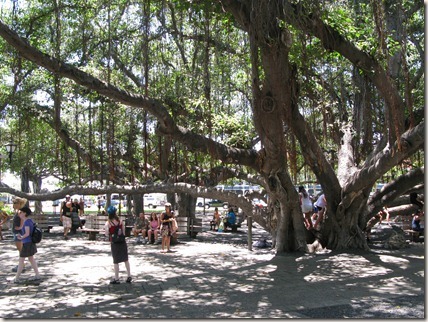 Our tour guide, Brenda, had found this destination in the Maui Revealed book, where it was listed as "not to be missed." After paying for parking (who would have thought Diamond Parking was in Hawaii, too? ), we headed into the valley on the paved trail. 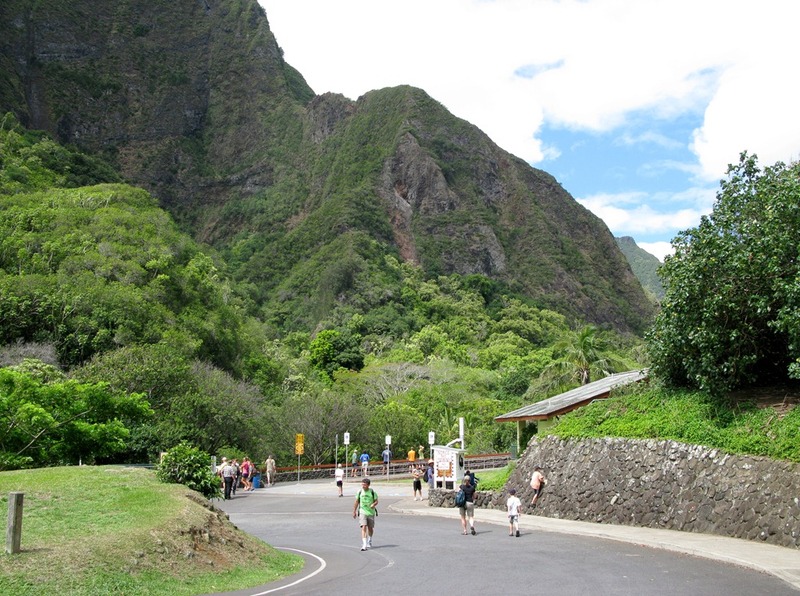 One of the bloodiest Hawaiian battles ever took place here in 1790, the "Battle of Kepaniwai." The battle started when King Kamehameha's war fleet of about 1200 warriors landed on Maui and advanced on Kalanikupule, son of King Kahekili II -- who was away in Oahu. The armies fought for two days, with neither side gaining the upper hand. On the third day, Kamehameha's army unleashed two cannons (with the help of two Royal Advisors) and annihilated the Maui warriors. Bodies damned up the stream. Hence, "Kepaniwai," means "the damming of the waters." But some did escape the fighting. Women, children, and the elderly were sent up the mountainside, and many escaped after the battle, along with Kalanikupule, his brothers, and other Maui chiefs. 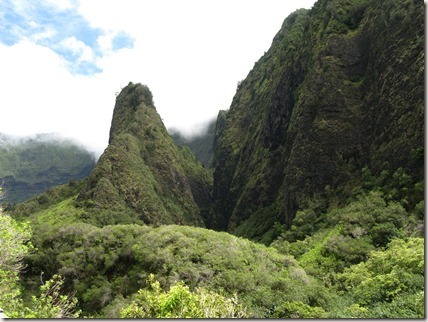 They eventually sought refuge in Oahu and Molokai. As I hiked up the lush valley, I found it hard to imagine such a terrible battle happening here -- and harder still to imagine people climbing up the steep valley walls. 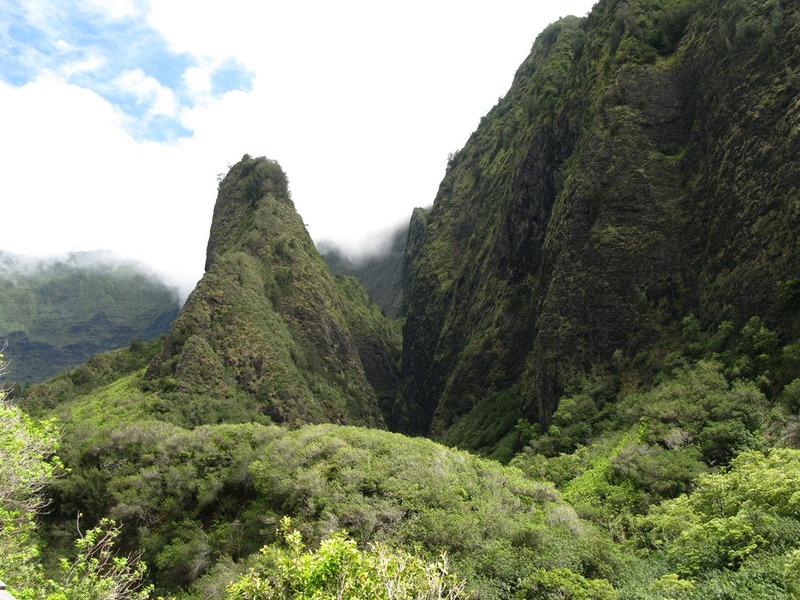 We climbed up to the viewpoint of the Iao Needle, a spectacular finger of rock reaching into sky. There's a peacefulness here that I've only felt in a few other places in the world. I can see why the Hawaiians thought this was sacred ground. 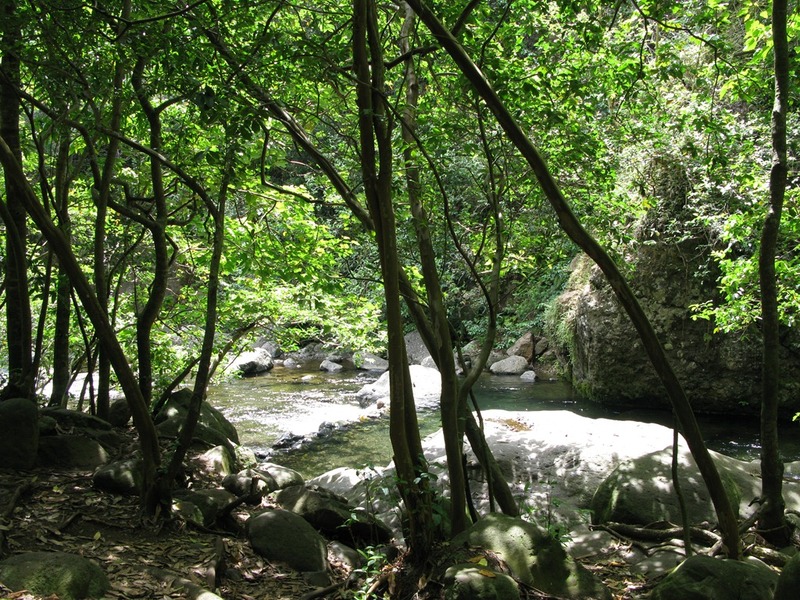 Finally we hiked down to the stream that had been dammed up with bodies all those years ago. I was surprised at all the flash flood warning signs, but torrential rain can happen quickly in Hawaii as I'd witnessed a few times. 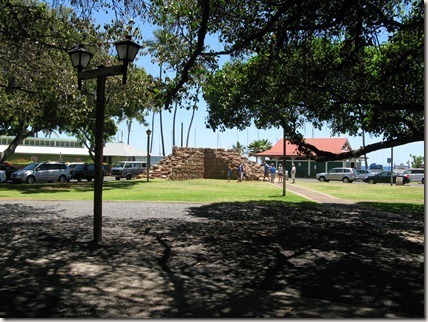 Next we drove to Lahaina, a quirky seaside town rich with Hawaiian history. Before this trip, I'd only heard of Lahaina from the Lilo and Stich soundtrack. 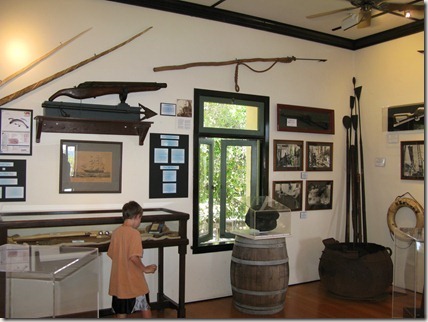 Lahaina was the capital of the Kingdom of Hawaii from 1820-1845. It was also the center of the global whaling industry in the 19th century. It's the second most visited location on Maui, and has nine buildings that were declared National Historic Landmarks in 1962. 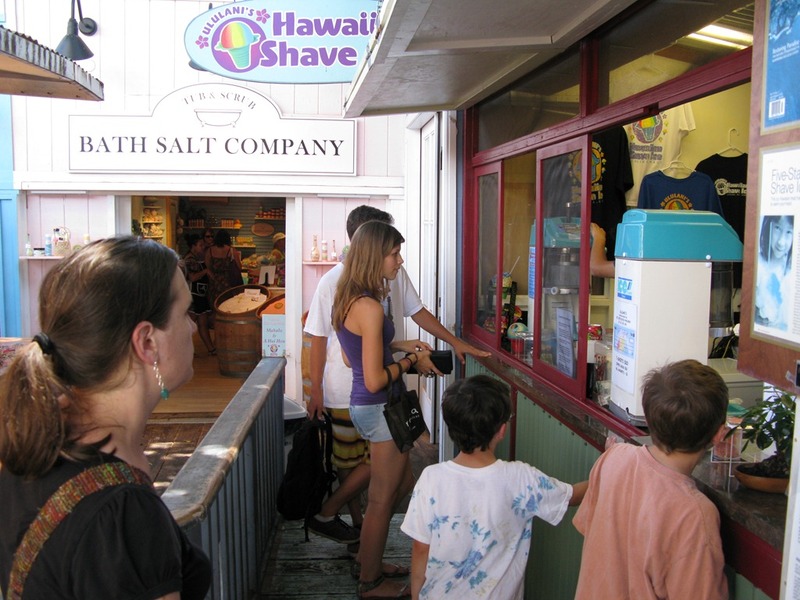 Lahaina has been central to key western-introduced industries such as whaling, pineapple and sugar. 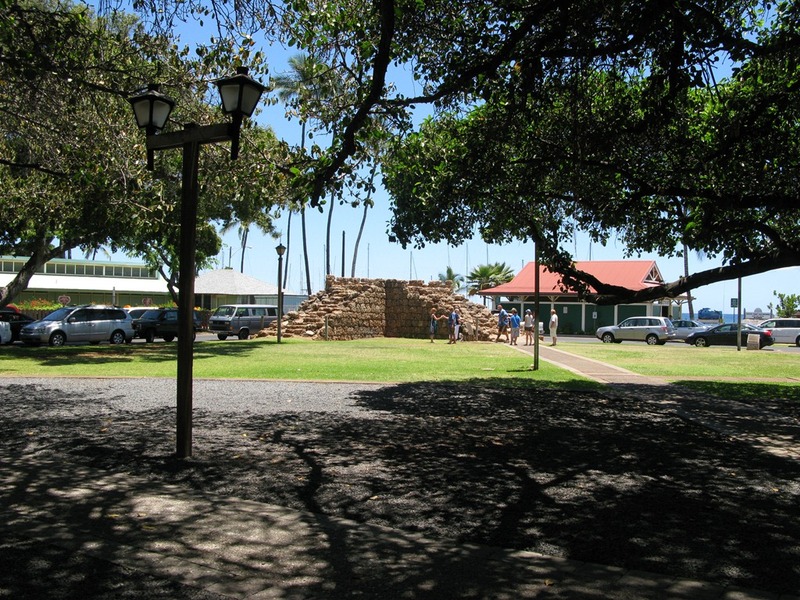 Lahaina has also been a place where immigrants landed; a place with ancient sacred grounds; a capital of a united Hawai'i; and a place where missionaries came to impose their ideals on a native people and visiting sailors with equal fervor. Lahaina has literally been everything from a place of battle, destruction and tragedy, to a place of royalty, celebration and pleasure. As I walked the streets of Lahaina, I was reminded of the peculiar energy of New Orleans. 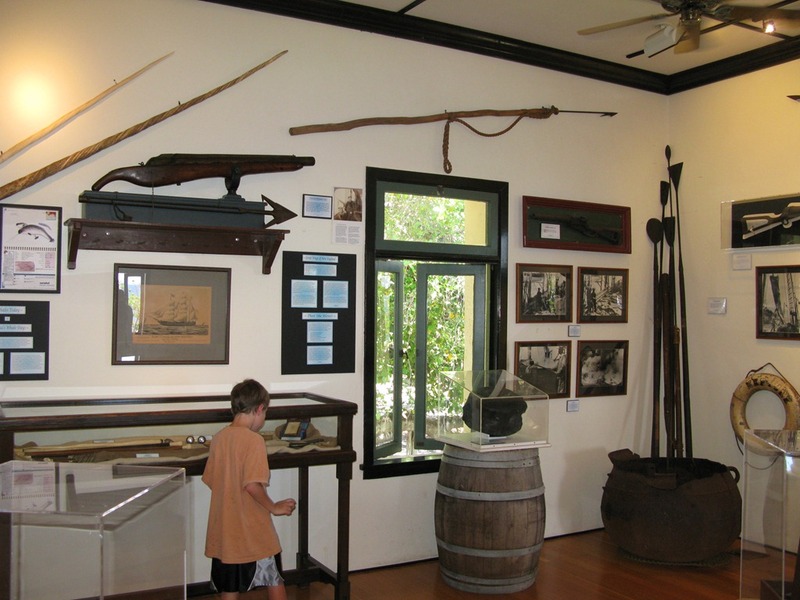 History is everywhere on the waterfront: the old fort ruins, a giant banyan tree that spreads across an entire park, and the whaling artifacts in the Old Courthouse. For lunch, we ate at Da Kitchen at the Wharf, a comfortable outdoor restaurant located in the middle of an open square. Even with the umbrella and canvas roof, I sweated through my meal (nothing new in Maui). 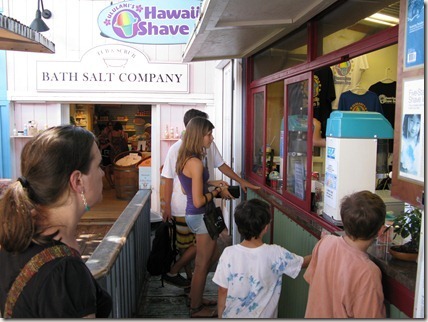 After lunch, we walked the streets, turning into a few shops here and there (I bought the boys more "Dirt Shirts"), and ending up at Ululani's Shave Ice -- our second shave ice experience. For me, the syrup was a bit too sweet, but Brenda raved about the mango, passion fruit, and coconut flavors. 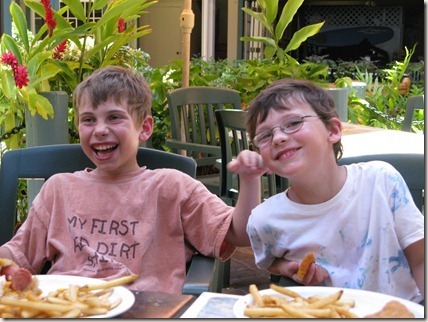 Earlier in the day, we'd booked the Atlantis Submarines tour, something Cameron and Drew really wanted to do. (I should point out that their interest began after recently watching The Hunt for Red October and reading chapters out of Blind Man's Bluff.) I also wanted to do it, but the thought of diving below the surface made me a bit nervous. 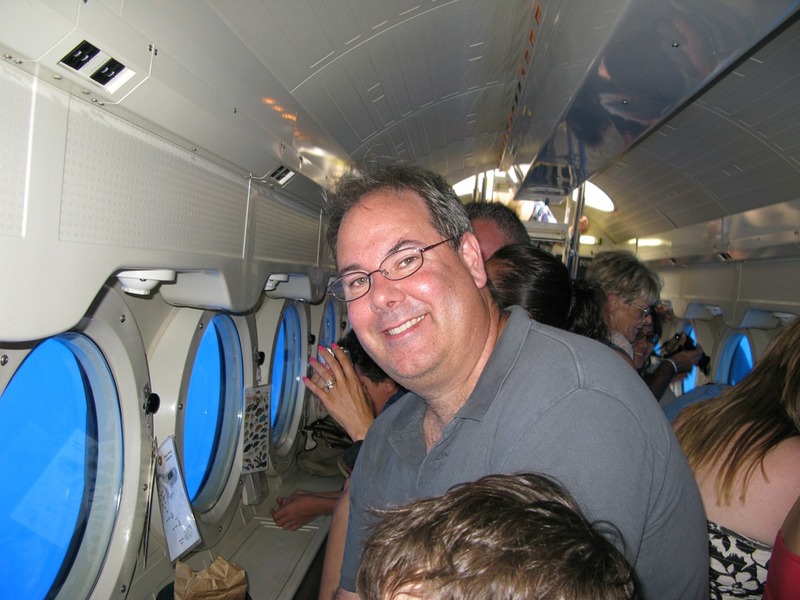 I'd never been in a submarine before -- not even the one in Disneyland, 'cause that freaked me out when I was little. 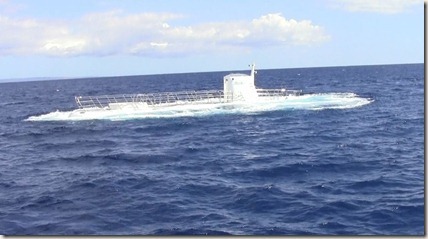 After we baked in the sun at the Atlantis dock, we took a boat out to the submarine. 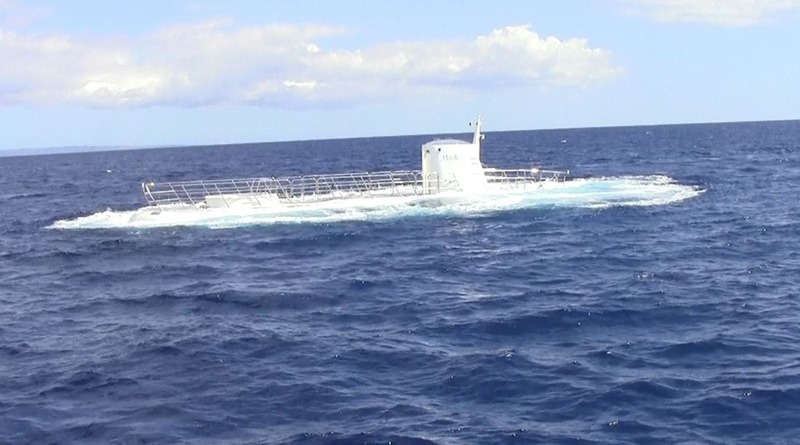 When we arrived at the dive site, the submarine was still submerged. As corny as the "chatter" was between the surface and the sub, it was pretty impressive seeing the sub rise up from the blue waters. We boarded the submarine, and then held onto the rails as we rocked in the waves. The current passengers disembarked from two hatches, bow and stern, and loaded onto the boat that we'd just left. After that, it was our turn to go below. I had imagined feeling claustrophobia in the submarine, but I was pleasantly surprised by the spacious Atlantis cabin. There were two rows of seats facing large portals, so you sit back-to-back with fellow passengers in the other row. Out the window all we could see was clear blue water and the hull of the support boat -- which I now saw was a catamaran. 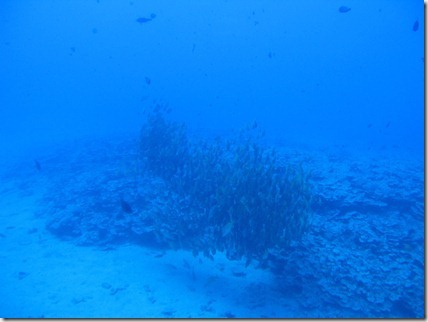 After we got the signal to dive (again, a bit corny), we dived to 100 feet until we saw the sandy ocean floor. The only sound in the cabin was the maneuvering thrusters -- no groans from the hull. 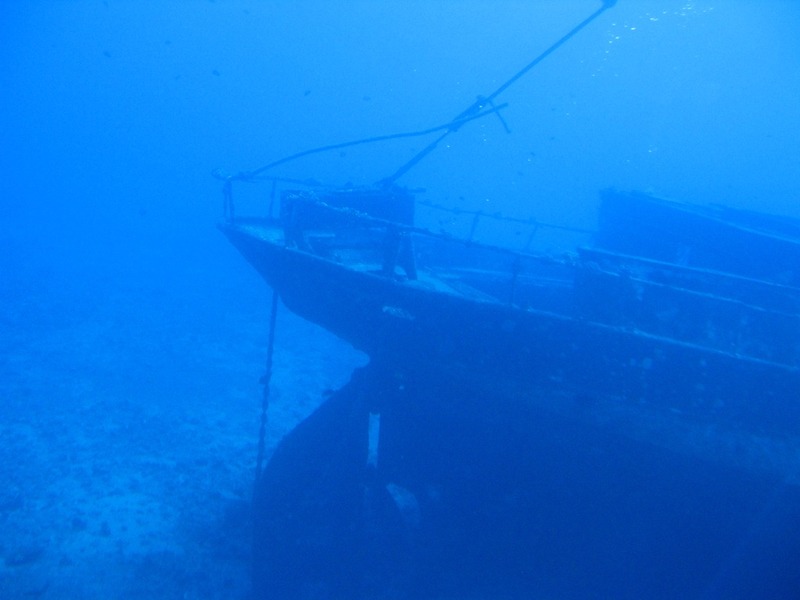 We soon learned that the ocean looked very different at 100 feet below the surface. 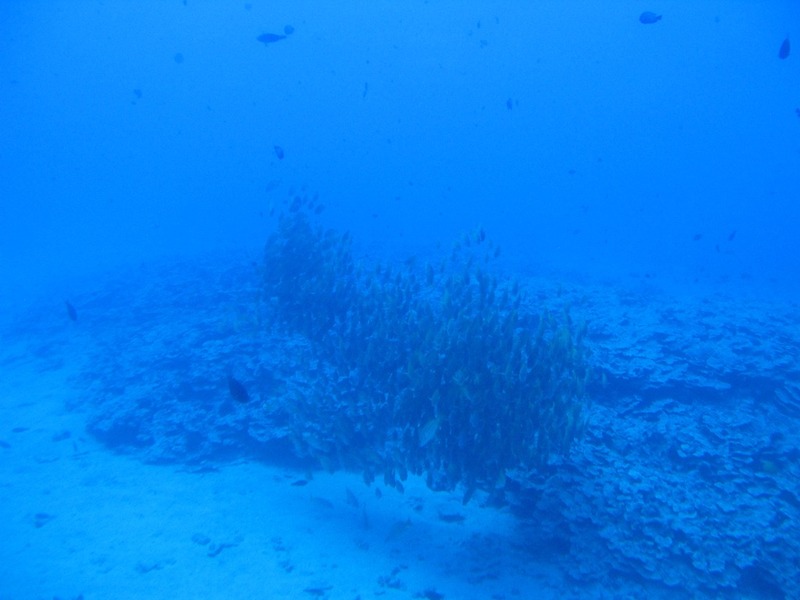 The usual vibrant colors of fish, coral, and other sea life are muted. The guide (who sounded like Nicholas Cage over the PA) told us the light at this depth is in the ultraviolet part spectrum; in other words, the vibrant colors are all there, we just can't see them. He also showed us how this part of the spectrum changes the way your teeth look (pink for kids, orange for adults), as well as the color of your clothes. After cruising around on the ocean floor for about 40 minutes, including stops at a deliberately sunken ship (the Carthaginian) and resting briefly on the sandy ocean floor at a max depth of 130 feet, we were given the green light to surface. Even though the dive was a bit too rehearsed at times (there's a script that the guide follows, including funny sound effects, music, and pop culture references to Titanic and Sponge Bob), there's nothing quite like diving below the surface. And while it might not look the way you imagined it would, the real novelty is being that far under the water in a real submarine. 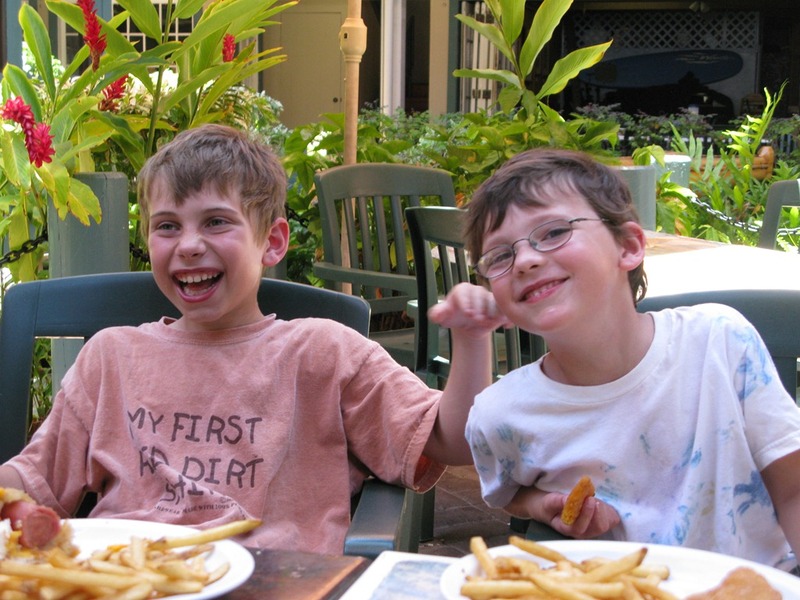 Cameron's review: "Can I come back every day and do this?"